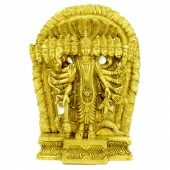 It is significant that the stories of Vishnu rose to prominence after the rise of Buddhism. Prior to that, Hinduism was the religion of the elite-based complex rituals known as yagna and esoteric speculations captured in texts known as the Aranyakas and the Upanishads. These seemed very distant to the common man who focused on fertility rituals, worship of plants and animals and nature. The first chapter focuses on how gender is used to explain fundamental metaphysical concepts integral to Hinduism. The second chapter discusses the difference between man and animal. The third and fourth chapters focus on the Devas and the Asuras, both of whom are unhappy, as one struggles with insecurity and the other with Ambition.